Plummer Lake, North Central Wisconsin (Aug 24, 2006) It was 41 years ago since I last stepped on the hallowed grounds of the Ryan Family's lakefront cabin. The small pines and alders still dotted the gentle slope to the beach. Some growth-challenged maples, already changing to their fall colors, were mixed in. 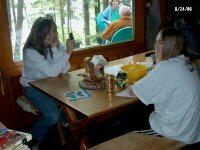 My cousin Katie stood again in the doorway of the one-room cabin. My grandfather's workshop, just small and cozy enough for a comfortable chair and a bottle of rye hadn't changed. The boathouse, though a little aged, looked familiar. 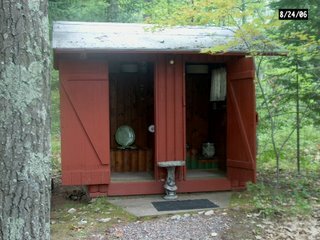 The two-seat outhouse had not been updated (can an outhouse be improved? ), but I hear that it has nearly filled up, and changes may be in order. Once inside the cabin, my God, it was a time-warp that words can hardly describe. The same thick-planked picnic table near the kitchen window. Kitchen cabinets and decorations--the same. The beds, the other furnishings, the pictures and animal skins on the wall, exactly as they were 40 years ago (at least in my own mind's eye). 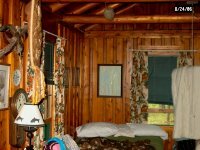 Most of all was the rich, honeyed-glaze patina of the cabin's pine interior. The view out over the small lake certainly hadn't changed--no new homes could be seen, no new development of any kind. This is the north-central area of Wisconsin, where home buyers of 20 years ago feel lucky if their home values have appreciated one percent a year. For the first time since leaving Seattle, both kids seemed to be having a good time. 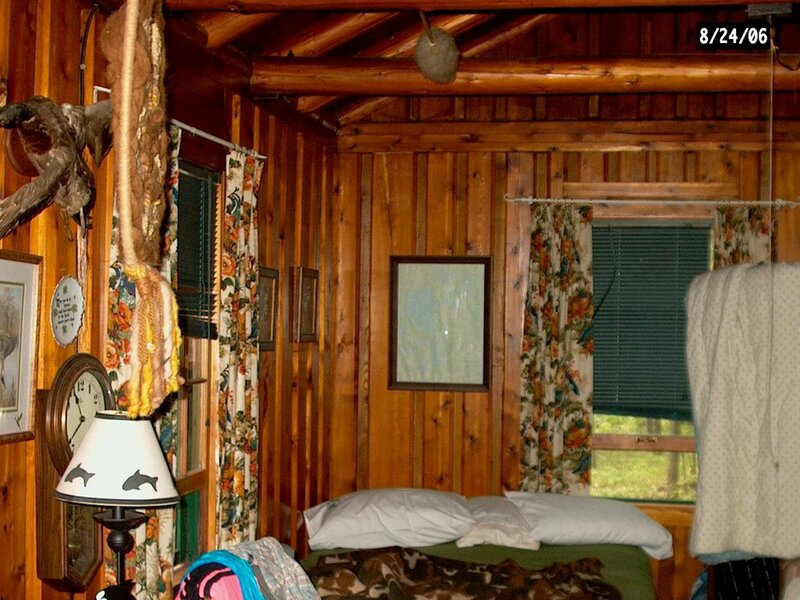 I think they felt a real family connection, if not a sense of history, by finally seeing this modest little cabin I had mentioned to them so many times. Or maybe it was because for the first time since leaving Minneapolis on Tuesday, they had reliable cell phone coverage. Even though I had been here only once before, I remember it as a great time, fishing with my grandfather, swimming and lots of good eating. I can't believe it has been so long since I've been able to come back. We had a nice lunch and enjoyed some time with cousin Katie and her parents, sister and parents. We went out for an ill-fated ride in the pontoon boat, but were blown onto the far shore when the outboard motor conked out, possibly because of some bad fuel. We had a long hike back to the house, where we fired up the trusty fishing boat with its 1970's vintage Johnson 6-horse and went to rescue the much bigger pontoon boat. The legendary mosquitos were a no-show, as were the much-dreaded biting flies. By 4pm, we were on the way to Merrill, the re-union's location and "ancestral" home of the modern Ryan clan. Loved the post, and all the pictures from the lake and Merrill that I've seen. You lucked out on the weather and mosquitoes I think. I'm glad it hasn't gotten all built up around there. No picture of the outhouse on the blog? What is it with you and pontoon boats? this summer? hey, can you take out the first ? in my comment? As SB is apparently obsessed with outhouses, I have granted her request and posted a picture. A simple question and I'm obsessed? But thanks for the picture, that's a classic. I really thought they had crescent moons on the doors, but I was wrong.